I realized I had to make things; it was no longer just a hobby. It became my new anti-depressant. What do you want next month to bring your way? What will next year be about for you? Read on, because it is never to early to ponder some big (and smaller) questions inside the pages of a journal. Sometimes I feel like I only have questions and no answers. I feel lost and don’t know where to go or what to do with myself… Does this happen to you too? This is when you need to sit down and think hard about your life, but of course it is a difficult job to do. You might feel too overwhelmed by inner questions to even get started. Not even google can present the right answers, especially when the questions are of a more personal nature. Maybe they involve your present and future plans, how you can set your own goals in life or rethinking the situation that you’re in. Sometimes you’re forced to do this, by the situation you’re in, sometimes you choose the change yourself and go looking for it. Whatever the situation, you really really need to focus on life issues sometimes in your life. More often than not, really. I truly believe that this is important work! But how to start you ask? I felt my previous questionative post turned out rather negative. It is me complaining and feeling lost – but it was a good thing I pressed my favorite button in WordPress: Save and Continue! :-) I got so many helpful and nice comments back I was amazed. Where did all that come from? Thank you! One advice I got was to wait and do nothing. This is great advice when questions whirl around in your head. But I also believe that you can wait for too long. I do it all the time. You could wait a life-time without finding any answers, especially if you don’t take the time to form the questions. Time does not always make things clearer, action and research (within) is sometimes necessary! I’ve been “doing nothing” for so long now I can hardly remember how to walk, so baby-steps might be necessary from now on. That list of questions I wrote last week was in no way complete (I have a lot more to consider), but those were the once that popped up as I searched the inside of my brain at the time. And now as I’ve been away over the weekend I have (some of) the answers! How did I do it? So easy! 2. Then answer them yourself! I printed my list of questions about things I need to ponder and make decisions about (see photo at the top of this post)! I brought the list with me on the train and then cut out each question (one row at a time) and glued it into my diary! Then I wrote about the corresponding subject. When I started with “I want” I knew the answer was closer than I had expected! I mean, I know what I want, but… I need to focus. To GTD (get things done!)! I need to stop some things that occupies my time and shift my attention to other stuff that might be more difficult but that will take me closer to my goals (new and old). It was kind of like I had created my own writing prompts! The answers just came as I saw the questions. You could do this with almost anything in your life that needs some serious thinking. Guide yourself, be your own teacher. Have you heard the expression When the pupil is ready, the teacher will come?? Off course you have! I think we are our own best teachers, but we just don’t know it yet. Or we don’t trust our own answers perhaps? PS: This post has ID-number 900? Isn’t that amazing!? That’s is quite an achievement! 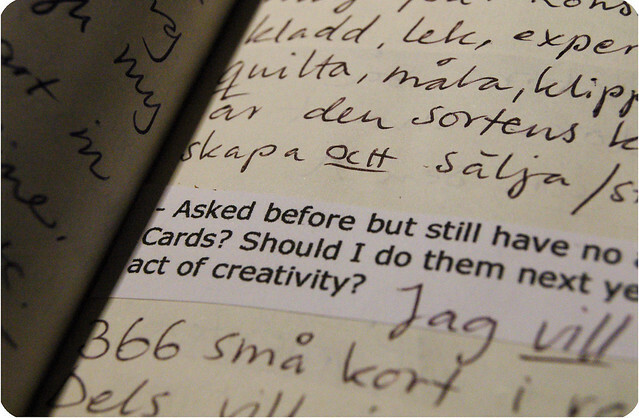 This entry was posted in On writing and tagged diary writing, journaling, pondering, questions, soul searching. Bookmark the permalink. Glad to see you found some answers. i think crafting is my anti-depressant too. thanks for sharing all that you do. i hardly ever comment, but i do enjoy reading! I can’t even remember how I found you but I was hooked when I did find you. All my blog friends are famous to me. It is so hard to put yourself out there and sometimes I read blogs and they cover up things, hold back. You do not and I love that. You feel the way all of us do and you express that. I think that craft for a month is a great idea. I can work on all my lost projects. The questions are a great idea. I have plenty of moleskins to fill. so glad you’re doing aedm this year! I love the idea of doing your own writing prompts. I am going to try that. Glad your feeling back on your path again. Hanna, this is such a great post. It really, truly is. Also? That quote is quite a gem. Lovely. I’m sure I’ll think back on that a lot, as well as your own words. I love the patchwork notebooks! I’m inspired. I can relate to your feelings of vertigo. I have been there. One thing that really helped me was to write down one of my heart’s desires every day. Then take one step (small is good) toward that desire. For instance, today, my heart’s desire was to sew something beautiful. But, I don’t know how to sew. So today,I took an introductory sewing class.Very basic. That’s one step toward my heart’s desire. Answers are in the journey – not the destination. I’m glad you shared that, Hanna. I feel like a crazy woman every time i just HAVE TO create something and that’s (a small) part of the reason that I miss you so much! I mean, I know you’re a bit nuts too, but I like being nuts togehter. Hanna, I love the way you share your process with us ! It is the same process so many of us are going through and your way of expressing it is so very relate-able. The thing that rang the truest for me today was how we have to learn to trust ourselves as our own teachers, that we really do know what we “have” to do…we just have to trust that voice. Also focusing on what might be more “difficult” once in a while rather than getting distracted from our purpose by doing the “easy” work… Like you said, it is one thing to pause in the midst of chaos to rest for awhile but it is also sometimes necessary to give ourselves a little kick in the behind so we get back to “work”! I am looking for that kick, right now, I think !!! Again, thanks for sharing stuff in that great IHanna way ! Thank you for encouraging us to ask questions Hanna! Your opening quote really stuck with me because I have been working on jewelry nonstop lately… I find it to be very meditative and it allows me to clear my head, ask my questions, and find the answers. Hanna, I don’t think your previous post was negative; it was a “pondering”; serious dreaming out loud. It seems apparent it gave many of your readers food for thought, which is about the best thing a writer can do. I know your post helped me sort through some of my own thoughts and for the first time in a long time I thought about planning (I’m so disorganized). I look forward to your (and my) creative November! I think so many times we run around looking for something, but we don’t know that’s what we’re doing. We shop, we eat, we play games, we blab, we think we are getting somewhere. I think it helps so much to write. Writing makes us stop doing all of that because we’re busy writing. We’re using our hands and minds and focus by writing. And it’s not even the writing that matters, it’s the internal dialogue. If you can exercise all that seeking seeking seeking energy by asking yourself questions and answering yourself, it really calms the mind, calms the spirit. And we stop trying to do things like shop, eat, talk about nothing, to make ourselves feel like we’re doing something. Thank you for these posts. It has helped me to focus. I find that daily journaling is a great brain dump. I pose all of my questions and ideas and they all seem to eventually come together like a plan that I had only dreamed of. It’s easy to get overwhelmed with the progress that we want to make, and I am in the baby step phase myself, at least it keeps my from being stuck and I’m getting closer to my goals all of the time. Thanks for posting, I enjoy your blog!